Claudio Baglioni is like the Bob Dylan of Italian music. The wordsmith and composer has managed to sustain a career in music for nearly four decades, creating more than 200 songs that have become part of Italy's musical vocabulary. His musical magic spread to Perth on Wednesday night when he enthralled the audience of all ages at the Regal Theatre. 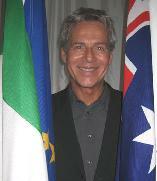 Baglioni's short stay in Perth made an impact on him because of the Italian migrant history. He said Italians left their homeland and made the ultimate sacrifice to find work and a better life for their children and future generations. The voyage to Perth was possibly the longest a migrant could have made, Baglioni said. Baglioni's visit to Perth was part of his Un Solo Mondo world tour, which started in the United States in March and will take him to 30 cities and across five continents. His philosophy is to join the people of the world through music. He will pursue various projects to make this dream a reality. Baglioni, who has collaborated with artists including Sting and Andrea Bocelli, said music was the most immediate form of communication. Music was like the sense of smell - it could instantly transport the listener through space and time to another place, a memory triggered by a melody or a combination of musical notes and lyrics, he said. One of his earliest songs, Questo Piccolo Grande Amore, is the highest-selling Italian song of all time and in 1985 was voted by Italians as the song of the century. Although written in the early 70s, the song still resonates with Italians of all ages. Baglioni is the modern renaissance man, exploring life's meaning in all its facets. He said music was a metaphor for life and people could live more in harmony in the global community by emulating the way musicians must interact to achieve harmony. Musicians must tune their instruments together in order to play successfully as one, he said. Baglioni hoped that humans could learn to do this to have a more peaceful existence. He said his visit to Perth was based on the desire to travel the world, sharing his music with his fans in countries and places he had never visited. He wished he had done this earlier because he had been inspired by the experience.